Rigel has introduced a new handheld safety analyser for the routine electrical testing of basic medical and laboratory equipment. 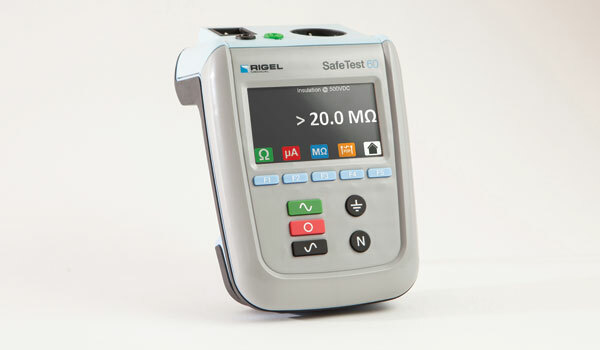 The new Rigel SafeTest 60 is a compact, robust and reliable safety analyser that is particularly well suited to high volume testing demands, with a simple colour coded user interface, push button operation and the fast step-through of test routines. The general purpose tester includes a comprehensive range of safety tests for hospital and medical equipment such as medical beds and chairs, operating tables, hoists, infusion pumps, CPAP’s, centrifuges and other similar equipment that does not require patient lead testing. As such, the SafeTest 60 is suitable for electrical testing to ensure compliance with a range of international safety standards including leakage testing to IEC 60601, IEC 62353, IEC 61010 and NFPA-99. In addition, to meet the needs of some specific types of equipment, the unit also has the capability to carry out insulation testing in line with IEC 62353 and accurate high current, low energy earth bond testing to both IEC 62353 and IEC 61010. In all cases, full manual control means only those specific tests that are required can be carried out, with minimised power breaks and full control of power cycles helping to ensure that testing is carried out quickly and efficiently – without any compromise in accuracy or integrity of testing. As part of the new streamlined approach to carrying out electrical safety tests, an automatic warning of secondary earth/ground paths ensures that users are made aware prior to invalid results being obtained, eliminating time consuming re-tests and ensuring correct and valid results are provided first time. The new Rigel SafeTest 60 is available in a wide range of power supply configurations to meet standard local operating conditions around the world. The new SafeTest 60 forms part of a comprehensive range of high performance specialist biomedical test equipment from Rigel Medical.